The eight different conservatory kitchens take centre stage at the buffet, giving it a very theatrical effect; diners can watch their food being prepared freshly in front of them and each ‘live’ station showcases one of the many different ethnic cuisines that has shaped Singapore over the past decades. The laksa with homemade lobster balls are to die for, and we had endless helpings of the crepe suzettes. Behold, the 10 highlights of our experience at Colony. Alluding to the voyage the British took to travel to the East Indies for trade and commerce in the eighteenth century, Colony is a culinary journey through Singapore’s heritage cuisines. Start your meal at The Ice Bar which features a wide variety of International cheeses, nourishing salads, premium crustaceans and superior cold cuts. We were blown away by the impeccably fresh salmon sashimi and excellent foie gras terrine. You bet we had multiple servings! From king crabs, poached ‘live’ prawns to seasonal oysters, the items at The Ice Bar are rotational but freshness and quality are top notch. And honestly, are we the only ones who couldn’t stop taking photos of the immaculate set-up and splendour of the seafood display? The Grill & Rotisserie, live kitchen showcases a delectable selection of Asian and Western meats grilled to perfection! We were drooling at the sight of the roast pork belly and our all-time favourite Hainanese chicken rice. We were initially apprehensive and thought about giving the chicken rice a miss because we didn’t want to “waste tummy space” for something we can get easily at hawker centre. We are but human to think this way, right? BUT WE WERE WRONG. THE HAINANESE CHICKEN RICE WAS EASILY THE BEST WE HAD. Compared to those “branded chicken rice” restaurants in Singapore; Colony’s version wins them hands down! The grains of rice – so plump and full, soaked with the essence of the chicken and perfumed with the fragrance of pandan leaves. The chilli was on point too. Best chicken rice. Period. The Steam Basket comprises Asian noodles and dainty dim sums. But if you only have the stomach capacity for one dish, we suggest you dive straight for their laksa. The laksa had the entire table raving about it all night as we were impressed by its brilliant execution. 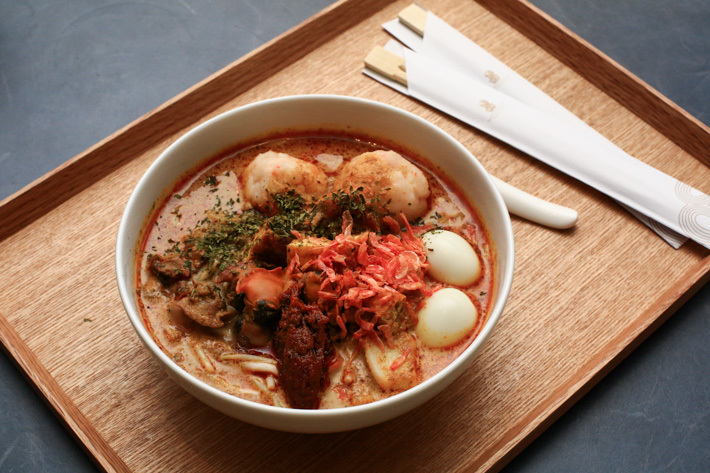 While Colony’s laksa has retained most of the traits of a traditional laksa recipe , the culinary team has cleverly used handmade lobster balls instead of the classic fish balls, for the added X-factor. By the way, if you are the kind who would pay extra at the hawker centre for more cockles, you know what? Colony uses very fresh and huge cockles for their laksa, and you are more than welcome to ask for more! Most buffet items are on a rotational basis but Colony’s laksa is available daily as one of their signature dishes. 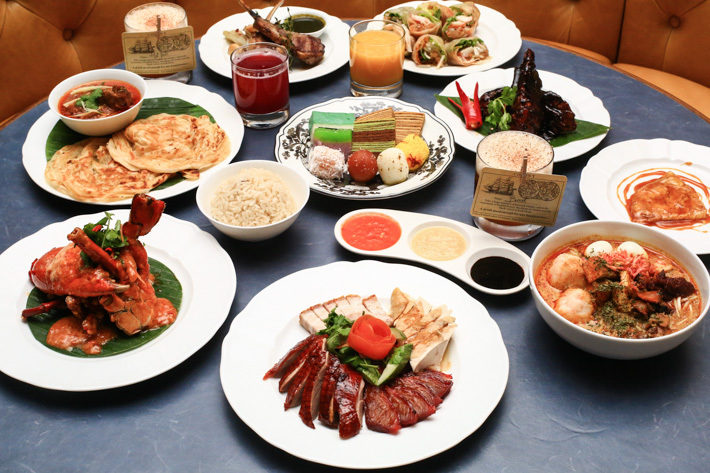 Fast forward to modern Singapore and diners can enjoy local dishes such as the famous Singapore Chilli Crab, Chinese-style Braised Pork, Black Pepper Crayfish and Seafood Fried Rice with XO Sauce over at The Wok. The extensive selection grants you the opportunity to sample a vast variety of local delights in bite-sized portions. Should you have any friends visiting Singapore for a holiday, we recommend you bring them to Colony for an ultimate feast; it is definitely a fantastic representation of Singapore as the ultimate food paradise..
Singaporean cuisine is not complete without Indian Tandoori-style dishes, and the traditional Roti Prata. Crispy on the outside and delightfully fluffy on the inside, we dare say it is one of the best we have had in a long while. 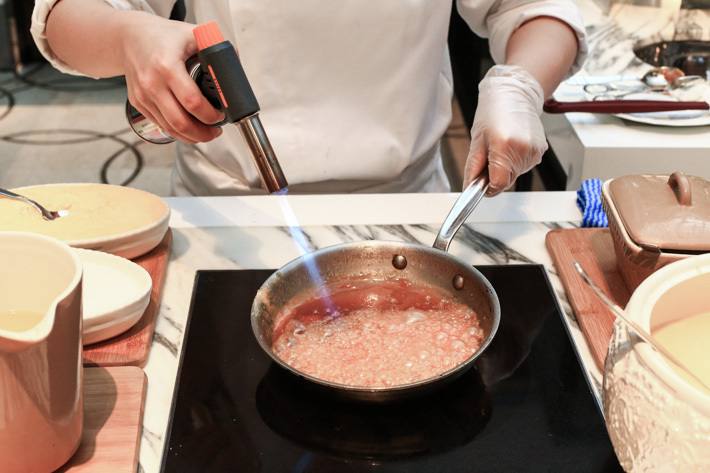 Diners can choose their Roti Prata with or without egg and the chef will whip up a piping hot serving in no time. Besides the attention-grabbing Roti Prata, diners will also be spoilt for choice – help yourselves to the assorted naans, lasooni lamb steak and prawn kali mirchi, cooked in the tandoori oven. Health junkies, listen up! The Fruit Stall at the Colony offers an assortment of whole fruits and freshly pressed juices that will have you salivating in glee. Grab a refreshing “Juice of the Day” or customize your own concoction. Herein lies the fun – all you have to do is to simply pick your favourite fruits from the bar and have the server cold-press them for you in their superior Korean juicer. We were beyond thankful for this wholesome quick fix, and the best part? Free flow. We know you might be stuffed by the time you are nearly done with all the mains, but as the saying goes – there is always room for dessert! With a seemingly infinite number of decadent desserts sitting prettily on the shelves, The Patisserie is truly a dessert paradise; we are pretty sure that even supermodel Adriana Lima would cave in and have the chocolate cake. We kid you not; chocolate cake is her weakness! Apart from the chocolate cake, you should try the Strawberry Shortcake and Nonya Kueh Talam. These are available on a rotational basis though, but if you’re lucky, you know what to do. When at Colony, you cannot miss out on the heavenly crepe suzettes! Watch the pastry chef in action as she prepares the crepes fresh upon receiving your order. You can choose to enhance your crepes with condiments, sauces and/or ice-cream. We urge you to complement it with a scoop of Chendol and/or Gula Meleka ice-cream – these sinful treats are well worth the calories! Pamper yourselves with Colony’s handcrafted cocktails (S$22++ each) where you get to experience their resident mixologist prepare a lovely concoction right next to your table. All the cocktails in the collection, such as the Long Journey and Bengal Brew, have been designed to mirror the passage from Britain to Singapore. The former is an adaptation of the traditional whiskey sour, where Great King Street whiskey is shaken with Irish Stout; while the latter is Earl Grey Tea and Rum mixed and pulled a la Teh Tarik-style. But of course, we are completely in awe of the décor and ambience of Colony and would return in a heartbeat for a stellar meal. The gorgeous contemporary East meets West interiors have been designed by award-winning designer Tony Chi and we love how the vintage maps, photographs and postcards adorn the walls and partitions. The option of booth seats also affords a greater level of privacy. Looking for somewhere to dine for a business luncheon, romantic date or family gathering? The all-new, stunningly beautiful Colony should be next on your list. Firstly thank you to a valued member of staff, Luna Bajracharya, who managed to get us a booking for the buffet dinner. We were brought there by friends in Singapore and it was an amazing experience. Excellent quality food and the choices available are the best. Staff very at tentative. Thank you all for great experience. I’m here in Singapore on holiday at the moment and after reading this article I went to Colony. Hands down best food I have eaten in Singapore, wildly more expensive than hawker food but for once not just for the surroundings but the food is simply much better than anything else I have tried. We are going again tonight ! •any credit card promotion or 1 for 1? •what is the price and theme of the day? •what is the menu of the day ?